This is a continuation of the anecdotes collected in the Book of Prophets by Imam Bukhari. As mentioned previously, these are stories and statements made about the Jews & Christians and are there for us to take lessons from. When Muawiya bin Abu Sufyan came to Medina for the last time, he delivered a sermon before us. He took out a tuft of hair and said, “I never thought that someone other than the Jews would do such a thing (i.e. use false hair). The Prophet (sallallaahu `alayhi wasallam) named such a practice, ‘Az-Zur’ (i.e. falsehood),” meaning the use of false hair. What follows is a collection of narrations about the Jews and Christians that have come to us from the Prophet (sallallaahu `alayhi wasallam) and his companions. These narrations include stories about some of them, a few statements that were made about them, and comparison between them and the Muslim ummah. What we should take from these stories and anecdotes is lessons for our lives. If it’s something good, we should be inspired to emulate it and if it’s something bad, we should try our best to stay away from it. May Allah be pleased with us and make us the best versions of ourselves. That one small good deed that we take for granted can tip the balance. Keep at it! On his death-bed Allah’s Apostle (sallallaahu `alayhi wasallam) put a sheet over his-face and when he felt hot, he would remove it from his face. When in that state (of putting and removing the sheet) he said, “May Allah’s Curse be on the Jews and the Christians for they build places of worship at the graves of their prophets.” (By that) he intended to warn (the Muslim) from what they (i.e. Jews and Christians) had done. This is what we need to keep in mind when we think some issues are non-issues. This is why we should make sure that whatever we do is somehow different (and better) from what the Jews and Christians did. This is why the Prophet (sallallaahu `alayhi wasallam) ordered Bilal to give Adhan to call for prayer instead of bells and fires. This is why we were told to fast 9th and 10th or 10th and 11th of Muharram instead of just the 10th as Jews do. And there are other examples which you’ll come across in ahadith below and some future posts. One day late, but I wanted to post this one. What an amazing story! Narrated Qabeesah, “Those were the apostates who reverted from Islam during the Caliphate of Abu Bakr who fought them”. Allah’s Apostle (sallallaahu `alayhi wasallam) said “How will you be when the son of Mary (i.e. Jesus) descends amongst you and he will judge people by the Law of the Quran and not by the law of Gospel. In many verses of the Glorious Qur’an Allah the Exalted denied the claim of the Christians that He has a son. A delegation from Nagran came to the Prophet Muhammad (pbuh). They began to talk about their claim about the Trinity, which is that Allah is three in one, the Father, the Son, and the Holy Spirit, with some disagreement among their sects. That is why Allah affirmed in many verses of the Qur’an that Jesus is a slave of Allah, whom He molded in the womb of his mother like any other of His creatures, and that He created him without a father, as He created Adam without a father or a mother. Allah the Almighty said: Allah chose Adam, Noah, the family of Abraham and the family of Imran above the Alamin (mankind and jinns)(of their times). Offspring, one of theo other, and Allah is All-Hearer, All-Knower. So her Lord (Allah) accepted her with goodly acceptance. He made her grow in a good manner and put her under the care of Zechariah. Every time he entered Al-Mihrab (a praying place or a private room), he found her supplied with sustenance. Allah declared that He had elected Adam (pbuh) and the elite of his offspring who obey Allah. Then He specified the family of Abraham (pbuh), which includes the sons of Ishmael (pbuh), and the family of Imran, the father of Mary. Muhammad Ibn Ishaaq stated that he was Imran Ibn Bashim, Ibn Amun, Ibn Misha, Ibn Hosqia, Ibn Ahriq, Ibn Mutham, Ibn Azazia, Ibn Amisa, Ibn Yamish, Ibn Ahrihu, Ibn Yazem, Ibn Yahfashat, Ibn Eisha, Ibn Iyam, Ibn Rahba am, Ibn David (Dawud). Prophet Zakariyah’s (pbuh) wife’s sister had a daughter named Hannah. She was married to Imran, a leader of the Israelites. For many years, the couple remained childless. Whenever Hannah saw another woman with a child, her longing for a baby increased. Although years had passed, she never lost hope. She believed that one day Allah would bless her with a child, on whom she would shower all her motherly love. She turned to the Lord of the heavens and the earth and pleaded with Him for a child. She would offer the child in the service of Allah’s house, in the temple of Jerusalem. Allah granted her request. When she learned that she was pregnant, she was the happiest woman alive, and thanked Allah for His gift. Her overjoyed husband Imran also thanked Allah for His mercy. As it was their custom to draw lots to solve disagreements, they followed this course. Each one was given a reed to throw into the river. They had agreed that whoever’s reed remained afloat would be granted guardianship of the girl. All the reeds sank to the bottom except Zakariyah’s. With this sign, they all surrendered to the will of Allah and made him the guardian. To ensure that no one had access to Mary, Zakariyah built a separate room for her in the temple. As she grew up, she spent her time in devotion to Allah. Zakariyah visited her daily to see to her needs, and so it continued for many years. One day, he was surprised to find fresh fruit, which was out of season in her room. As he was the only person who could enter her room, he asked her how the fruit got there. She replied that these provisions were from Allah, as He gives to whom He wills. Zakariyah understood by this that Allah had raised Mary’s status above that of other women. Thereafter, Zakariyah spent more time with her, teaching and guiding her. Mary grew to be a devotee of Allah, glorifying Him day and night. The angel’s visit caused Mary great anxiety, which increased as the months went by. How could she face giving birth to a child without having a husband? Later, she felt life kicking inside her. With a heavy heart, she left the temple and went to Nazareth, the city in which she had been born where she settled in a simple farm house to avoid the public. But fear and anxiety did not leave her. She was from a noble and pious family. Her father had not been an evil man nor was her mother an impure woman. How could she prevent tongues from wagging about her honor? After some months, she could not bear the mental strain any longer. Burdened with a heavy womb, she left Nazareth, not knowing where to go to be away from this depressing atmosphere. Suddenly, she heard a voice nearby: “Grieve not, your Lord has placed a rivulet below, and shake the trunk of this tree, from which ripe dates will fall. So eat and drink and regain the strength you have lost; and be of good cheer, for what you see is the power of Allah, Who made the dry palm tree regain life, in order to provide food for you.” For a while she was comforted by Allah’s miracle, for it was a sure sign of her innocence and purity. She decided to return to the city. However, her fears also returned. What was she going to tell the people? As if sharinhis mother’s worry, the baby began to speak: “If you meet any person say: ‘I have vowed to fast for The Beneficent and may not speak to any human today. '” With this miracle, Mary felt at ease. Most of the people realized that the baby was unique, for it Allah wills something, He merely says “Be” and it happens. Of course, there were some who regarded the baby’s speech as a strange trick, but at least Mary could now stay in Nazareth without being harassed. Allah the Exalted revealed: And mention in the Book (the Qur’an, O Muhammad, the story of) Mary, when she withdrew in seclusion from her family to a place facing east. She placed a screen (to screen herself) from them; then We sent to her Our Ruh (angel Gabriel), and he appeared before her in the form of a man in all respects. Such is Jesus, son of Mary. (It is) a statement of truth, about which they doubt (or dispute). It befits not (the Majesty of) Allah that He should beget a son (this refers to the slander of Christians against Allah, by saying that Jesus is the son of Allah). Glorified (and Exalted be He above all that they associate with Him). When He decrees a thing, He only says to it, “Be!” – and it is. Then the sects differed (the Christians about Jesus), so woe unto the disbeliveers (those who gave false witness saying that Jesus is the son of Allah) from the meeting of a great Day (the Day of Resurrection, when they will be thrown in the blazing Fire). The Jewish priests felt this child Jesus was dangerous, for they felt that the people would turn their worship to Allah the Almighty Alone, displacing the existing Jewish tenets. Consequently, they would lose their authority over the people. Therefore, they kept the miracle of Jesus’s speech in infancy as a secret and accused Mary of a great misdeed. 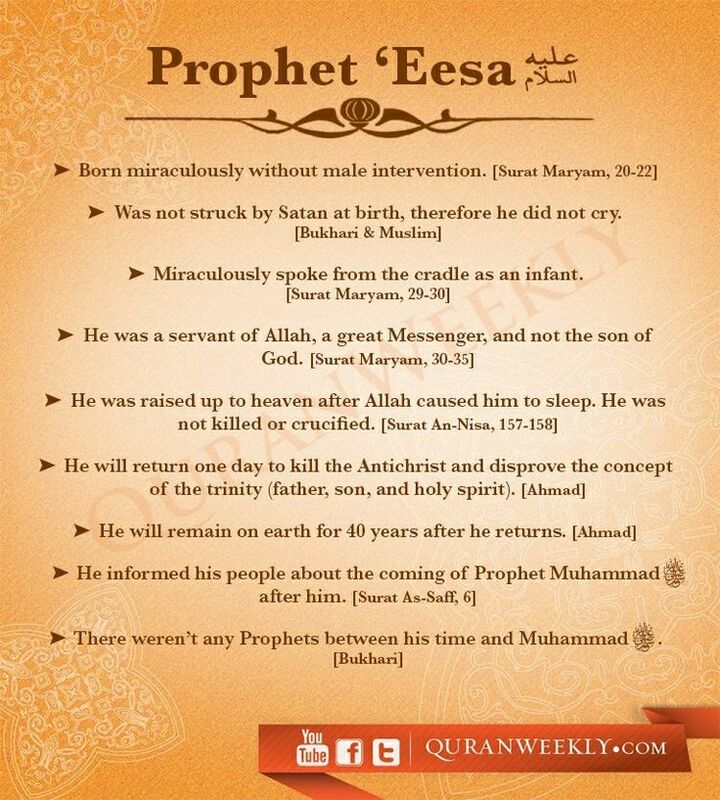 As Jesus (pbuh) grew, the signs of prophethood began to increase. He could tell his friends what kind of supper waited for them at home and what they had hidden and where. When he was twelve years old, he accompanied his mother to Jerusalem. There he wandered into the temple and joined a crowd listening to the lecture of the Rabbis (Jewish priests). The audience were all adults, but he was not afraid to sit with them. After listening intently, he asked questions and expressed his opinion. The learned rabbis were disturbed by the boy’s boldness and puzzled by the questions he asked, for they were unable to answer him. They tried to silence him, but he ignored their attempts and continued to express his views. Jesus became so involved in this exchange that he forgot he as expected back home. In the meantime, his mother went home, thinking that he might have gone back with relatives or friends. When she arrived, she discovered that he was not there, so she returned to the city to look for him. At last she found him in the temple, sitting among the learned, conversing with them. He appeared to be quite at east, as if he had been doing this all his life. Mary got angry with him for causing her worry. He tried to assure her that all the arguing and debating with the learned had made him forgot the time. Jesus grew up to manhood. It was Sabbath, a day of complete rest: no fire could be lit or extinguished nor could females plait their hair. Moses (pbuh) had commanded that Saturday be dedicated to the worship of Allah. However, the wisdom behind the Sabbath and its spirit had gone, and only the letter remained in the Jews’ hearts. Also, they thought that Sabbath was kept in heaven, and that the People of Israel had been chosen by Allah only to observe the Sabbath. They made a hundred things unlawful on Saturday even self-defense or calling a doctor to save a patient who was in bad condition. This is how their life was branded by such hypocrisy. Although the Pharisees were guardians of the law, they were ready to sell it when their interests were involved so as to obtain personal gains. There was, for example, a rule which prohibited a journey of more than one thousand yards on the Sabbath day. What do we expect of the Pharisees in this case? The day before, they transferred their food and drink from their homes two thousand yards away and erected a temporary house so that from tthey could travel a further thousand yards on the Sabbath day. Jesus was on his way to the temple. Although it was the Sabbath, he reached out his hand to pick two pieces of fruit to feed a hungry child. This was considered to be a violation of the Sabbath law. He made a fire for the old women to keep themselves warm from the freezing air. Another violation. He went to the temple and looked around. There were twenty thousand Jewish priests registered there who earned their living from the temple. The rooms of he temple were full of them. Jesus observed that the visitors were much fewer than the priests. Yet the temple was full of sheep and doves which were sold to the people to be offered as sacrifices. Every step in the temple cost the visitor money. They worshipped nothing but money. In the temple, the Pharisees and Sadducees acted as if it were a market place, and these two groups always disagreed on everything. Jesus followed the scene with his eyes and observed that the poor people who could not afford the price of the sheep or dove were swept away like flies by the Pharisees and Saducees. Jesus was astonished. Why did the priests burn a lot of offerings inside the temple, while thousands of poor people were hungry outside it? On this blessed night, the two noble prophets John (pbuh) and Zakariyah (pbuh) died, killed by the ruling authority. On the same night, the revelation descended upon Jesus (pbuh). Allah the Exalted commanded him to begin his call to the children of Israel. To Jesus, the life of ease was closed, and the page of worship and struggled was opened. Like an opposing force, the message of Jesus came to denounce the practices of the Pharisees and to reinforce the Law of Moses. In the face of a materialistic age of luxury and worship of gold, Jesus called his people to a nobler life by word and deed. This exemplary life was the only way out of the wretchedness and diseases of his age. Jesus’s call, from the beginning, was marked by its complete uprightness and piety. It appealed to the soul, the inner being, and not be a closed system of rules laid down by society. Jesus continued inviting the people to Almighty Allah. His call was based on the principle that there is no mediation between the Creator and His creatures. However, Jesus was in conflict with the Jews’ superficial interpretation of the Torah. He said that he did not come to abrogate the Torah, but to complete it by going to the spirit of its substance to arrive at its essence. He made the Jews understand that the Ten Commandments have more value than they imagined. For instance, the fifth commandment does not only prohibit physical killing, but all forms of killing; physical, psychological, or spiritual. And the sixth commandment does not prohibit adultery only in the sense of unlawful physical contact between a man and a woman, but also prohibits all forms of unlawful relations or acts that might lead to adultery. The eye commits adultery when it looks at anything with passion. Jesus was therefore in confrontation with the materialistic people. He told them to desist from hypocrisy, show and false praise. There was no need to hoard wealth in this life. They should not preoccupy themselves with the goods of this passing world; rather they must preoccupy themselves with the affairs of the coming world because it would be everlasting. Jesus told them that caring for this world is a sin, not fit for pious worshippers. The disbeliveers care for it because they do not know a better way. As for the believers, they know that their sustenance is with Allah, so they trust in Him and scorn this world. Jesus continued to invite people to worship the Only Lord, Who is without partner, just as he invited them to purify the heart and soul. His teaching annoyed the priests, for every word of Jesus was a threat to them and their position, exposing their misdeeds. The Roman occupiers had, at first, no intention of being involved in this religious discord of the Jews because it was an internal affair, and they saw that this dispute would distract the Jews from the question of the occupation. However, the priests started to plot against Jesus. They wanted to embarrass him and to prove that he had come to destroy the Mosaic Law. The Mosaic Law provides that an adulteress be stoned to death. They brought him a Jewish adulteress and asked Jesus: “Does not the law stipulate the stoning of the adulteress?” Jesus answered: “Yes.” They said: “This woman is an adulteress.” Jesus looked at the woman and then at the priests. He knew that they were more sinful than she. They agreed that she should be killed according to Mosaic Law, and they understood that if he was going to apply Mosaic Law, he would be destroying his own rules of forgiveness and mercy. Jesus understood their plan. He smiled and assented: “Whoever among you is sinless can stone her.” His voice rose in the middle of the Temple, making a new law on adultery, for the sinless to judge sin. There was none eligible; no mortal can judge sin, only Allah the Most Merciful. As Jesus left the temple, the woman followed him. She took out a bottle of perfume from her garments, knelt before his feet and washed them with perfume and tears, and then dried his feet with her hair. Jesus turned to the woman and told her to stand up, adding: “O Lord, forgive her sins.” He let the priests understand that those who call people to Almighty Allah are not executioners. His call was based on mercy for the people, the aim of all divine calls. Jesus continued to pray to Allah for mercy on his people and to teach his people to have mercy on one another and to believe in Allah. Jesus continued his mission, aided by divine miracles. Some Qur’anic commentators said that Jesus brought four people back from the dead: a friend of his named Al-Azam, an old woman’s son, and a woman’s only daughter. These three had died during his lifetime. When the Jews saw this they said: “You only resurrect those who have died recently; perhaps they only fainted.” They asked him to bring back to life Sam the Ibn Noah. Almighty Allah also revealed: And He Allah will teach him (Jesus) the Book and Al Hikmah (the Sunna, the faultless speech of the Prophets, wisdom, etc. ), (and) the Torah and the Gospel. Our Lord! We believe in what You have sent down, and we follow the Messenger (Jesus); so write us down among those who bear witness (to the truth, La ilaha ill Allah – none has the right to be worshipped but Allah). 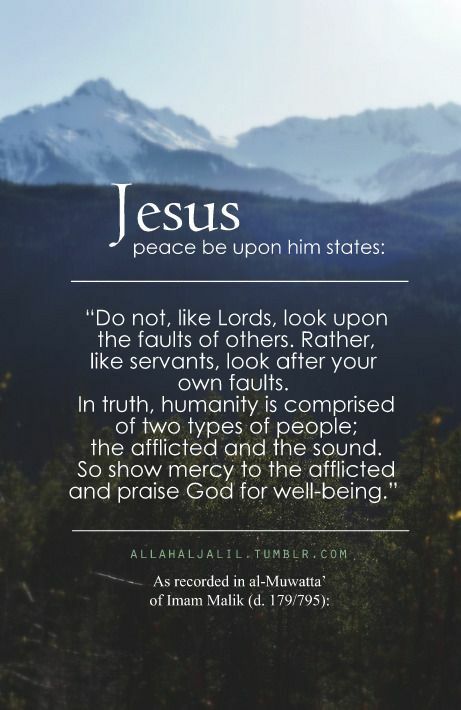 Jesus continued calling people to Almighty Allah and laying down for them what might be called “the law of the Spirit.” Once when standing on a mountain surrounded by his disciples, Jesus saw that those who believed in him were from among the poor, the wretched, an the downtrodden, and their number was small. Some of the miracles which Jesus performed had been requested by his disciples, such as their wish for a “holy table” to be sent down from heaven. It was related that Jesus commanded his disciples to fast for thirty days; at the end of it, they asked Jesus to bring food from heaven to break their fast. Jesus prayed to Allah after his disciples had doubted Allah’s power. The great table cam down between two clouds, one above and one below, while the people watched. Jesus said: “O Lord, make it a mercy and not a cause of distress.” So it fell between Jesus’s hands, covered with a napkin. It is said that thousands of people partook of it, and yet they never exhausted it. A further miracle was that the blind and lepers were cured. The Day of the Table became one of the holy days for the disciples and followers of Jesus. Later on, the disciples and followers forgot the real essence of the miracles, and so they worshipped Jesus as a god. Jesus went on his mission until vice knew that its throne was threatening to fall. So the forces of evil accused him of magic, infringement of the Mosaic Law, allegiance with the devil; and when they saw that the poor people followed him, they began to scheme against him. The Sanhedrin, the highest judicial and ecclesiastical council of the Jews, began to meet to plot against Jesus. The plan took a new turn. When the Jews failed to stop Jesus’ s call, they decided to kill him. The chief priests held secret meetings to agree on the best way of getting rid of Jesus. While they were in such a meeting, one of the twelve apostles of Jesus, Judas Iscariot, went to them and asked: “What will you give me if I deliver him to you?” Judas bargained with them until they agreed to give him thirty pieces of silver known as shekels. The plot was laid for the capture and murder of Jesus. It was said that the high priest of the Jews tore his garment at the meeting, claiming that Jesus had denied Judaism. The tearing of clothes at that time was a sign of disgust. The priests had no authority to pass the death sentence at that time, so they convinced the Roman governor that Jesus was plotting against the security of the Roman Empire and urged him to take immediate action against him. The governor ordered thaJesus be arrested. According to the Book of Matthew, Jesus was arrested and the council of the high priests passed the death sentence upon him. Then, they began insulting him, spitting on his face and kicking him. It was the Roman custom for the condemned to be flogged before they were executed. So Pilate, the Roman governor, ordered that Jesus be flogged. The Mosaic Law stipulates forty lashes, but the Roman had no limit, and they were brutal lashes. After that, Jesus was handed to the soldiers for crucifixion. They took off his clothes, and kept them. They put a crown of thorns on his head to mock him. According to custom he carried his cross on his back to increase his suffering. Finally, they reached a place called Golgotha, meaning the Place of Skulls, outside the walls of Jerusalem. Instead of giving him a cup of wine diluted with scent to help lessen the pain on the cross, the soldiers gave Jesus a cup of vinegar diluted with gall. Then they crucified him and, as a further mockery, two thieves with him. So it is written in the Bible. But the faith of Islam came with views quite different from that of the extend gospels with regards to both the end of Jesus and his nature. The Glorious Qur’an affirms that Allah the Exalted did not permit the people of Israel to kill Jesus or crucify him. What happened was that Allah saved him from his enemies and raised him to heaven. They never killed Jesus, they killed someone else. Allah the Almighty declared: And because of their saying (in boast), “We killed Messiah Jesus, son of Mary, the Messenger of Allah,” but they killed him not, nor crucified him, but the resemblance of Jesus was put over another man (and they killed that man) and those who differ therein are full of doubts. They have no certain knowledge, they follow nothing but conjecture. For surely; they killed him not (Jesus, son of Mary): But Allah raised him (Jesus) up (with his body and soul) unto Himself (and he is in the heavens). And Allah is Ever All Powerful, All Wise. Almighty Allah also revealed: And remember when Allah said: “O Jesus! I will take you and raise you to Myself and clear you (of the forged statement that Jesus is Allah’s son) of those who disbelieve, and I will make those who follow you (Monotheists, who worship none but Allah ) superior to those who disbelieve (in the Oneness of Allah, or disbelieve in some of His Messengers, e.g. Muhammad, Jesus, Moses, etc., or in His Holy Books, e.g. the Torah, the Gospel, the Qur’an) till the Day of Resurrection. Then you will return to Me and I will judge between you in the matters in which you used to dispute.” (Ch 3:55 Quran). Almighty Allah refuted the claims of the Jews and the Christians in many verses of the Glorious Qur’an. Indeed you have brought forth (said) a terrible evil thing. Whereby the heavens are almost torn, and the earth is split asunder, and the mountains fall in ruins, that they ascribe a son (or offspring or children) to the Most Beneficent (Allah). Allah the Exalted also declared: Yet, they join the jinns as partners in worship with Allah, though He has created them (the jinns), and they attribute falsely without knowledge sons and daughters to Him. Be He Glorified! And Exalted above (all) that they attribute to Him. He is the Originator of the heavens and the earth. How can He have children when He has no wife? He created all things and He is the All-Knower of everything. Such is Allah, your Lord! La ilaha illa Huwa (none has the right to be worshipped but He), the Creator of all things. So worship Him (Alone), and He is the Wakil (Trustee, Disposer of affairs, Guardian etc.) over all tings. Almighty Allah commanded: O people of the Scripture (Jews and Christians)! Do not exceed the limits in you religion, nor say of Allah aught but the truth. The Messiah Jesus, son of Mary, was (no more than ) a Messenger of Allah and His Word, (“Be” – and he was) which He bestowed on Mary and a spirit (Ruh) created by Him; so believe in Allah and His Messengers. Say not: “Three (trinity)!” Cease! (It is ) better for you. For Allah is the only One Ilah (God), Glory be to Him (Far Exalted is He) above having a son. To Him belongs all that is in the heavens and all that is in the earth. 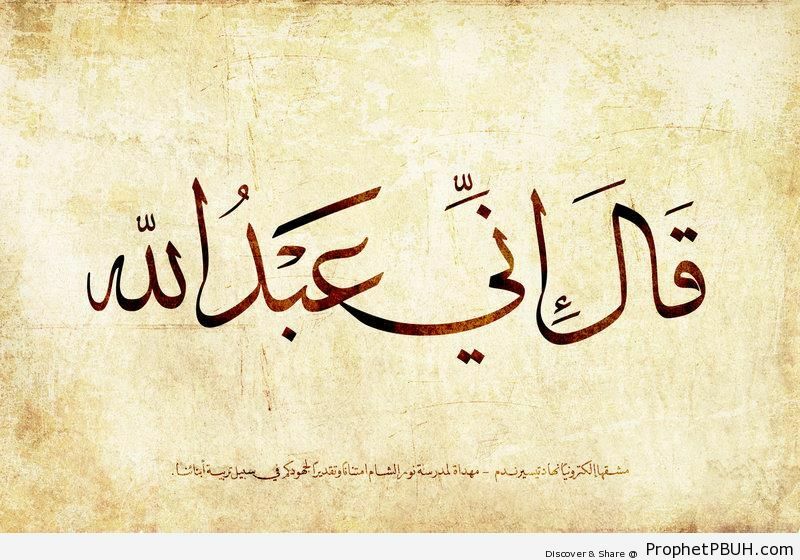 And Allah is All Sufficient as a Disposer of affairs. Almighty Allah also declared: And the Jews say: Ezra is the son of Allah, and the Christians say: Messiah is the son of Allah. That is a saying from their mouths. They imitate the saying of the disbeliveers of old. Allah’s Curse be on them, how they are deluded away from the truth! Allah the Almighty also revealed: Now ask them (O Muhammad): “Are there (only) daughters for your Lord and sons for them?” Or did We create the angels females while they were witnesses? Verily, it is of their falsehood that they (Quraish pagans) say: “Allah has begotten off-spring or children (angels are the daughters of Allah)” And, verily, they are liars! Has He (then) chosen daughters rather than sons? What is the matter with you? How do you decide? Will you not then remember? Or is there for you a plain authority? Then bring your Book if you are truthful! And they have invented a kinship between Him and the jinns, but the jinn know well that they have indeed to appear (before Him) (i.e. they will be brought for accounts). And Almighty Allah declared: Surely, in disbelief are they who say that Allah is the Messiah, son of Mary. Say (O Muhammad): “Who then has the least power against Allah, if He were destroy the Messiah, son of Mary, his mother, and all those who are on the earth together?” And to Allah belongs the dominion of the heavens and the earth, and all that is between them. He creates what He wills. And Allah is Able to do all things. And (both) the Jews and Christians say; “We are the children of Allah and His loved ones.” Say: “Why then does He punish you for your sins?” Nay, you are but human beings, of those He has created, He forgive whom He wills and He punishes whom He wills. And to Allah belongs the dominion of the heavens and the earth and all that is between them, and to Him is the return of all. Allah the Exalted warned: Surely they have disbelieved who say: “Allah is the Messiah (Jesus), son of Mary.” But the Messiah (Jesus) said: “O Children of Israel! Worship Allah, my Lord and your Lord.” Verily, whosoever sets up partners in worship with Allah, then Allah has forbidden Paradise for him, and the Fire will be his abode. And for the Zalimun (polytheists, and wrong-doers) there are no helpers. Surely, disbeliveers are those who said: “Allah is the third of the three (in a Trinity).” But there is no Ilah (god) (none who has the right to be worshipped) but One Ilah (God- Allah). And if they cease not from what they say, verily, a painful torment will befall the disbeliveers among them. Will they not repent to Allah and ask His Forgiveness? For Allah is Oft-Forgiving, Most Merciful. Maryam bint Imran, the mother of Prophet Isa, was no ordinary lady. Allah had chosen her for the extraordinary and miraculous birth of Isa. Studying her life as described in the Quran and Hadith, we see how pious and dedicated she was. Her belief in Allah was so strong that it also inspired her guardian, Prophet Zakariya, to ask Allah for a righteous child. A dua and faith in Allah can go a long way! You’ll see when you read the story of the birth of Maryam. (O my Lord! I have vowed to You what is in my womb to be dedicated for Your services, so accept this from me. Verily, You are the All-Hearer, the All-Knowing.) meaning, You hear my supplication and You know my intention. She did not know then what she would give birth to, a male or a female. (And the male is not like the female,) in strength and the commitment to worship Allah and serve the Masjid in Jerusalem. (This night, a son was born for me and I called him by my father’s name, Ibrahim.) Al-Bukhari and Muslim collected this Hadith. They also recorded that Anas bin Malik brought his newborn brother to the Messenger of Allah who chewed a piece of date and put it in the child’s mouth and called him `Abdullah. Other new born infants were also given names on the day they were born. This Hadith was collected by Ahmad and the collectors of the Sunan, and was graded Sahih by At-Tirmidhi. We should mention that another narration for this Hadith contained the wording, “and blood is offered on his behalf,” which is more famous and established than the former narration, and Allah knows best. (And I seek refuge with You for her and for her offspring from Shaytan, the outcast).” The Two Sahihs recorded this Hadith. (made her grow in a good manner) meaning, made her conduct becoming, her mannerism delightful and He made her well liked among people. He also made her accompany the righteous people, so that she learned righteousness, knowledge and religion.